Sundance Film Festival might seem like it’s all about movies, but music plays a major role in the annual 10-day event as well. From the Sundance ASCAP Café to BMI’s annual Snowball to intimate performances at bars up and down Main Street, the options are endless, both for credential holders and for the general public. 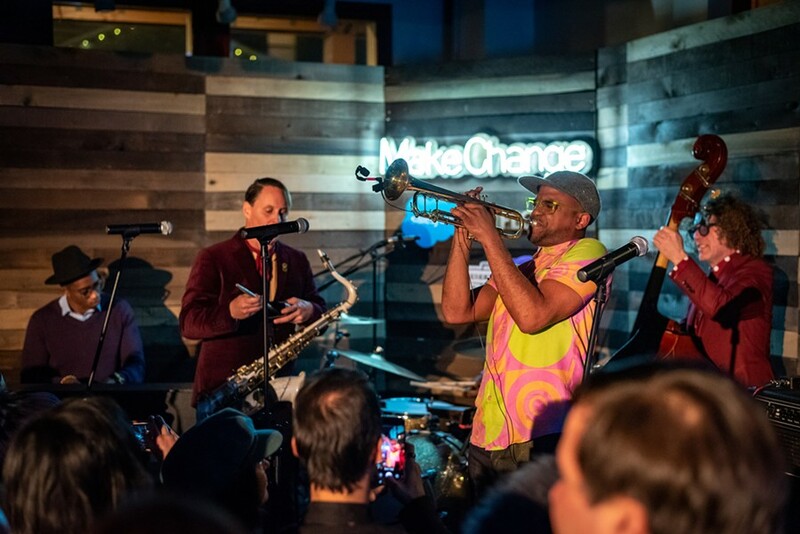 But the best music I saw this week came at the exclusive Salesforce Music Lodge, which hosted three days of #MakeChangeSeries events Jan. 25-27. On Friday afternoon, Anne Litt of KRCW sat down with revered rock ‘n’ roll photographer Danny Clinch to talk about how his work humanizes and amplifies the musicians he’s covered over the years. On Saturday afternoon, Litt chatted with Arcade Fire’s Win Butler and Reginé Chassagne about The KANPE Foundation, which advocates for Haitian musicians both at home and among the diaspora. And on Sunday afternoon, Litt joined New Orleans icon Ben Jaffe, who serves as bandleader of Preservation Hall Jazz Band and leader of the Preservation Hall Foundation. The best moments came at night. On Saturday, Preservation Hall Jazz Band backed Butler and Chassagne as they riffed on some of Arcade Fire’s biggest hits (and a moving cover of John Lennon’s “Mind Games”). After an hour, Butler began spinning deep cuts as DJ Windows 98, with Chassagne dancing in the crowd and various members of Preservation Hall coming out for solos and improvisations. Although the line to get in lasted for several hours, the end result was extra special as the crowd danced right up front with everyone in the band and bartenders from Water Witch in Salt Lake City served up tasty libations. On Sunday, Jaffe and the Preservation Hall Jazz Band didn’t just settle for a panel and performance. In the mid-afternoon, they led a second line parade up and down Main Street, sprinkling some Louisiana soul on the Sundance crowd and taking the spirit of New Orleans straight to the streets. During his panel with Witt, Jaffe talked about the foundation’s recent project, A Tuba for Cuba, which documented their trip to Cuba as they retraced their musical roots. Later that night, the band played two different sets for a jam-packed crowd, with Butler and Chassagne stepping on stage for a couple of tracks, along with freestyling comic Reggie Watts. 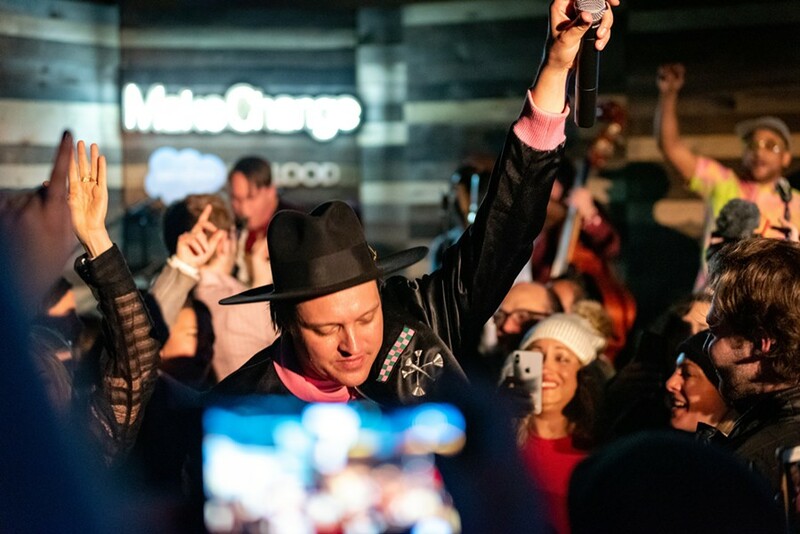 If Sundance is all about special moments, the Salesforce Music Lodge and its #MakeChangeSeries delivered them. The Sundance ASCAP Café didn’t have quite the air of exclusivity, but compelling performances still abounded throughout the week. Argentinian Claudia Brant belted out beautiful boleros over fingerpicked guitar while Asian-American songwriter MILCK built a riveting 30-minute set around her cathartic pop anthem “Quiet.” On Sunday and Monday, mid-century rock revivalists Warbly Jets put on two trademark lubed-up performances after playing The State Room on Saturday night; on Tuesday and Wednesday, Sundance revelers had two chances to see progressive mariachi shapeshifters Flor de Toloache. The international focus continued on Thursday night, when Brazilian Seu Jorge lent his emotional baritone to a performance from the movie Abe, while Sundance ASCAP kept up its connection with Americana music through the ACM & Bluebird Café Songwriters Series, which featured pickers like Carlton Anderson, Deana Carter, Jacob Davis and Lee Ann Womack. The Sundance premiere of the new Wu-Tang Clan documentary, Of Mics & Men, resulted in a spike in sightings of RZA, GZA, Method Man, Raekwon, Ghostface Killah, Inspektah Deck, U-God, Cappadonna and Masta Killa. Each night throughout the week, two of three of the MCs would drop in at bars, pop-up parties and other exclusive gatherings, delivering a taste of the best rap music on the planet. Salt Lake City fans can get their fill tonight at Sky, where Method Man will team up with Redman. Hip-hop heads have other options, too, with master wordsmith Talib Kweli playing at O.P. Rockwell in Park City tonight, Friday, Feb. 1, and at Soundwell’s Lyrically Lifted series on Saturday, Feb. 2.